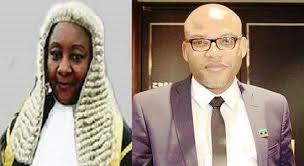 IPOB has received information confirmed by our intelligence team that Buhari through his secret police the DSS have succeeded in putting pressure on Justice Binta Nyako to fake illness and not attend the hearing tomorrow in the case involving the IPOB leader Nnamdi Kanu. This was the same delay tactics used to pressure judges in the past to deliver illegal rulings in favour of the unconstitutional DSS. Despite the fact that the focus of the world is on the Nigerian Judicial System, Buhari egged on by Daura of DSS is bent on perverting the course of justice again. The world is hereby put on notice that Justice Binta Nyako is in danger of being blackmailed by Buhari who has threatened to reopen corruption charges against her husband, former Governor of Adamawa State Murtala Nyako if she appears in court tomorrow. This tactic of intimidating judges handling this case and subversion of justice must be resisted by all men and women of good conscience. Judges who cannot be compromised and at various times ruled against Buhari's interest are facing corruption charges while those mired in corrupt practices whilst presiding over cases for Buhari, like the epitome of corruption and disgrace to the legal profession, Justice John Tsoho are still allowed to preside over cases while fearless judges have been barred from handling courts cases. Justice Binta Nyako was sighted on Friday the 4th of November 2016 in good health. If she fails to turn up to preside over the hearing tomorrow the 8th of November 2016, the world should know that Buhari has succeeded through his DSS to intimidate this woman the way they intimidated and compromised John Tsoho the previous judge.